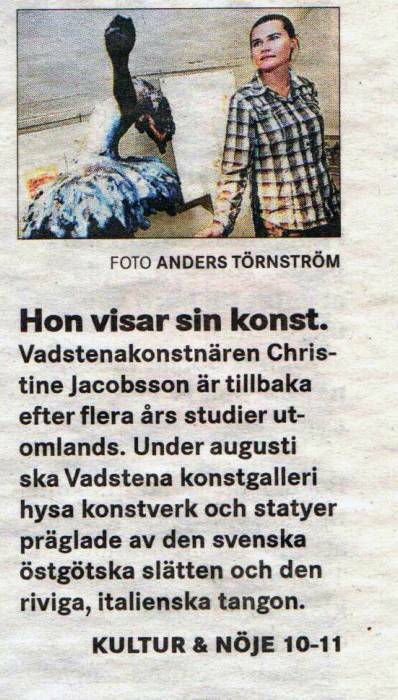 visar oljemålningar, skulptur och grafik på Galleri Kultur i Rödtornet den 2 april-20 maj.
Christine Jacobsson visar oljemålningar, skulptur och grafik på Galleri Kultur i Rödtornet den 2 april-20 maj.
exhibition:Galleri Christine, Kasta 112,Vadstena . Galleri Omberg‎Lördagsmys - Öppna ateljéer vid Omberg! 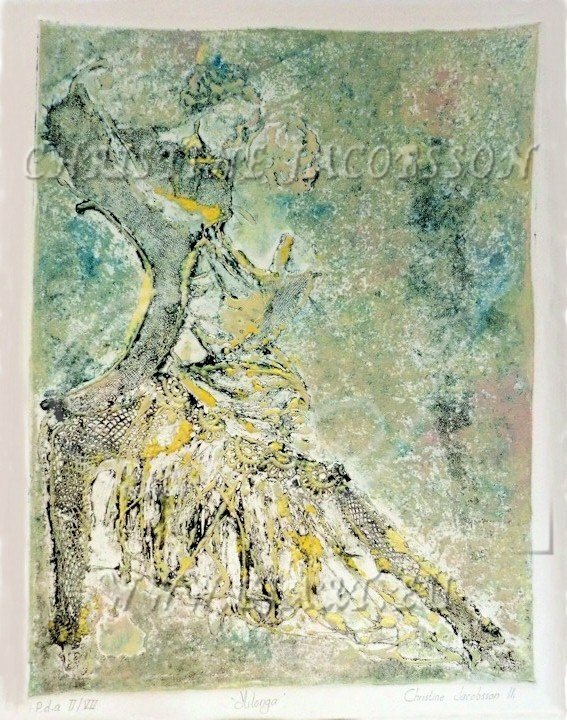 exhibition:House of Dance, Hunnerbergsgatan Operating Happiness Christine Jacobson portrays joy of dance in different art expressions. Welcome to view her art in the House of Dance! Cost: Free admission Organizer: Municipality of LinkÖping. Now you can order a Christmas card from me ... the models of the cards can be blah see 2 on Karin's business and 3 MIx in Vadstena. Call for more info. The cards cost 10 SEK (1,10 Euro)each. Nu kan man beställa julkort av mig...förlagorna till korten kan man bla se 2 på Karins affär och 3 på MIx i Vadstena. Ring för mera info. Korten kostar 10 kr (1,10 euro) styck. December 2013 - exhibition opening at the Peruvian consulate in San Francisco (USA). Jag är för närvarande i Peru vid en strand utanför Lima. Jag har sökt inspiration till min konst i detta fascinerande land. Jag förbereder en konstutställning med 20 oljemålningar med inspiration av Peru. Jag kommer att ge vidare information om när och var jag kommer att ställa ut mina målningar. Och ni kommer att se mina målningar på hemsidan. I am currently in Peru, pù precisely at a beach near Lima. I have sought inspiration for my art in this fascinating country. I am preparing en exhibition with 20 oilcancases with inspiration from Peru. 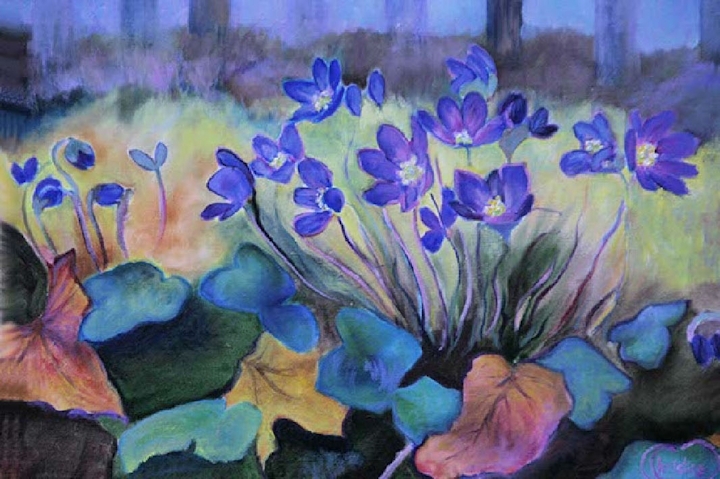 I will publish more information about when and where my paintings will be exhibited and you will be able to see the paintings on my homepage. Actualmente estoy en Perú, más concretamente en una playa cerca de Lima. He buscado la inspiración para mi arte en este fascinante país. Me estoy preparando en exposición con 20 cancases aceite con la inspiración de Perú. Voy a publicar más información sobre cuándo y dónde mis pinturas estarán en exhibición y usted será capaz de ver los cuadros en mi homepage. Sono attualmente in Perù, più precisamente in una spiaggia vicino a Lima. Ho cercato ispirazione per la mia arte in questo affascinante paese. Sto preparando una mostra con 20 quadri ad olio,con temi e soggetti di isparazione Peruviana.Pubblicherò ulteriori informazioni su quando e dove i miei quadri saranno esposti e si sarà in grado di vedere i dipinti sulla mia homepage. 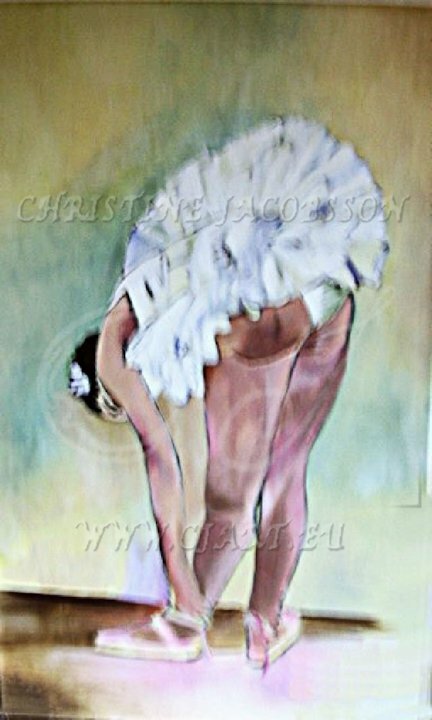 Christine Jacobsson, Artist. 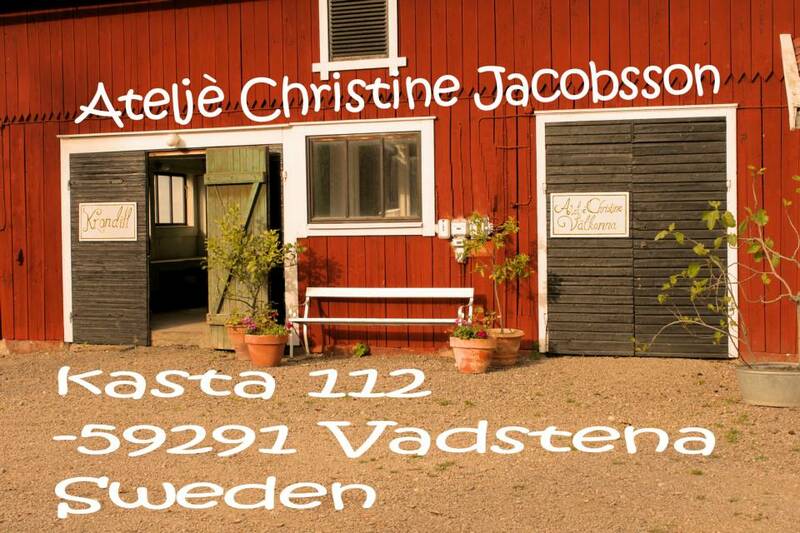 Christine Jacobsson was born in 1981 on Kasta Länsmansgård, a farm outside the small town Vadstena in Sweden. This year she is working with a peruanian artproject in Peru that will be exhibited in USA. Christine graduated with honor after five years at Accademia delle Belli arti in Venice and in Florens. Her final vote was 110 of 110. Christine has received financial assistance from the Swedish Institute and the Italian Department of Foreign Affairs. 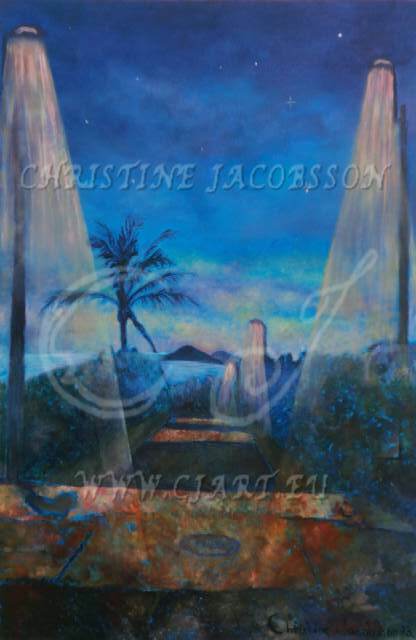 Christine seeks to represent an infinite gratitude and love in all her artistic works, “Amore l’infinito”. In May 2009 Christine experienced much success with the project Startpoint organized by Accademia delle belle arti. Among other things she hung her blue background Amore l’infinito at the Galleria Fritelli in Florence. In the simple she here finds answers to the complex. 2007/08 The Swedish Institute’s Country Specific Grant for one year of art studies. 2009 The Swedish Institute’s Grant for one year of art studies. Christine Jacobson nació en 1981 en Kasta Länsmansgård, una granja cerca de la ciudad de Vadstena, Suecia. En 2011 asistió a una Maestría en Bellas Artes en la Academia de Bellas Artes de Venecia, donde se graduó con una puntuación de 110 puntos sobre 110. En 2006 comenzó a estudiar en la Academia de Florencia, y en 2009 se graduó con una puntuación de 110 puntos sobre 110. Él recibió asistencia financiera del Instituto Sueco y el Ministerio de Relaciones Exteriores de Italia. Amor Sin Fin Se trata de representar una gratitud infinita y el amor en todas sus obras artísticas, "l'Amore infinito". En mayo de 2009 Christine experimentado mucho éxito con el punto de inicio del proyecto organizado por la Accademia delle Belle Arti. Entre otras cosas que ella bajó la bluebackground l'Amore infinito en la Galleria Fritelli en Florencia. En el sencillo aquí que encuentra respuestas a lo complejo. Christine Jacobson è nata nel 1981 a Kasta Länsmansgård, una fattoria nei pressi della cittadina di Vadstena, in Svezia. Nel 2011 ha frequentato un Master of Fine Arts presso l'Accademia delle Belle Arti di Venezia dove si è si è laureata con la votazione di 110 punti su 110 . Nel 2006 ha iniziato a studiare presso l'Accademia di Firenze e nel 2009 si è laureata con la votazione di 110 punti su 110. Ha ricevuto assistenza finanziaria da parte dell'Istituto svedese e il Ministero degli Affari Esteri italiano. Lei cerca di rappresentare una infinita gratitudine e l'amore in tutte le sue opere artistiche, "l'Amore infinito". Nel maggio 2009 Christine esperienza molto successo con il progetto Start Point organizzato dall'Accademia delle Belle Arti. Tra le altre cose ha appeso il suo bluebackground l'Amore infinito alla Galleria Fritelli a Firenze.È nel semplice che trova risposte alla complessità. Hello Do you like my Art? Well, then you can ask for a free quote. Select the work you like and send me an email. I will send you all the information you need regarding price, size and material. 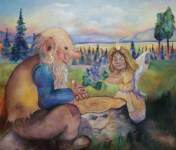 I also provide reproductions of my works on: small magnets, postcards and copies of painting. Check my webbshop and take a look of my creations. I try to turn dreams into reality. If you have a dream that you want to be realty you can order you special desired paintings for yourself or as a present. All this artworks are for sale in form of reproductions in different sizes. can also buy some of my originals that you see here and order your own designed painting in oil or watercolour. Please send me a mail for information about the prizes. Academy of Fine Arts in Florence and Venice, I learned to use all kinds of materials and techniques to produce unlimited amazing effects. I paint in oil and watercolor, I create sculptures in marble, glass, plastic, ceramic and bronze. I work with graphics in both a traditional and experimental way, like copper engravings, woodcuts, aquaforte acquatinta, punta secca, xilografia ect. I create experimental graphics on a plexiglas. I also have the knowledge of the mosaic and fresco. Juan Villacorta Paredes,Professor in art, Lima, (Perù). Christine Jacobsson is a painter of intense sensitivity: her paintings depict a range of feelings in the world of emotions that is invisible for most people. Trademark characteristics of her paitings are the vivid delicacy of their contrasts, the lightness of their shapes, the cleanness of their colors, the subtle spatial representation of their forms, the general luminescence of their images. Her style continues evolving while she travels around the world looking for subjects for her art. 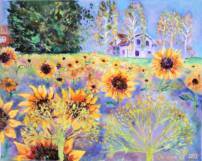 Recently, she visited Peru and the local landscapes, animals and people are now envisioned by her new paintings. Careful attention should be paid to the artwork of this painter who has a unique and enlightening visual expression of her surroundings and her inner cosmos. Doctor of art,Jorge Villacorta Santamato,Lima (Perù). I min konst är jag inspirerad av den genuint svenska kulturen och naturen och mina erfarenheter I andra länder som t ex Italien. Min ambition i konsten är att skapa min egen verklighet baserad på fantasi. Fantasin är en konkretisering av mina riktiga minnen och erfarenheter. Genom att måla kan drömmar bli verklighet. Mina ljusa barndomsminnen och min kärlek till livet tror jag utgör grunden för min konst. Jag älskar att kombinera och använda mig av båden ny och traditionell teknik. Ja tror att konsten i framtiden måste arbeta gränsöverskridande för att överleva. Min ambition är att min konst i slutändan kan ge andra lika mycket som den har gett mig. Mitt konstnärsskap innehåller mycket fantasirikedom och kärlek till livet. Jag hoppas att andra som ser min konst ska kunna känna hur det är att regnbågsdansa bland molnen och att solskenstraska på smultronstigarna i fantasins underbara verklighet. Jag vill representera en oändlig kärlek till livet. In my art I am inspired of the genuine Swedish nature and culture and my experiences in other places for example Italy. My goal in art is to create my own reality based on fantasy. My own world made of imagination comes from my real memories and experiences. Everything can become a reality even the unreal by just dreams and brush movements. My bright childhood memories and my love towards life is the basis of my art. I love to combine and use new and traditional technologies. I believe that art in the future must work across borders to survive. The intention is that my art will give others as much as it has given to me. My art is full of fantasy and love for life. The most beautiful diamond star in the celestial sphere can only be seen by those with moonlight eyes. Diamond art can thus only be experienced by those with a high concentration of imagination and a profound gratitude towards life. That is being Moon-steeped, as I call it. I wish that viewers of her art will experience what it is to“rainbow dance” among the clouds and “sunshine stroll” among the berry paths of the wonderful realities of imagination. I want to present an infinit love towards life. En mi arte me siento inspirado por la naturaleza y la cultura sueca y también a mis experiencias de vida en otros lugares, como en Italia. Mi meta en el arte es crear mi propia realidad, basándolo en la imaginación. Mi mundo de fantasía viene de mis recuerdos y experiencias reales. Cualquier cosa puede convertirse en una realidad, incluso lo irreal, que toma los sueños y los movimientos de un cepillo. Mis recuerdos de cuando yo era un niño brillante y mi amor por la vida es la base de mi arte. Me encanta combinar y utilizar las tecnologías nuevas y tradicionales. Creo que el arte en el futuro para sobrevivir tiene que evolucionar más allá de los límites conocidos. Mi intención es asegurarse de que mi arte se transmiten las emociones que me dieron cuando yo estaba haciendo en las obras. Mi arte está lleno de imaginación y amor por la vida. La más hermosa y brillante estrella en la esfera celeste es un diamante y sólo puede ser visto por aquellos cuyos ojos se iluminan con la luz de la luna. "Arte Diamond" por lo que sólo puede ser experimentado por aquellos que tienen una alta concentración de la imaginación y una profunda gratitud por la vida. Como yo lo llamo es la etapa de "Imersi en la Luna". Espero que los espectadores de mi arte podrán experimentar lo que significa "Rainbow Dance" en las nubes y el "paseo por el sol" en el camino de la maravillosa realidad y la fantasía. Quiero presentar un amor infinito hacia la vida. Nella mia arte mi ispiro alla natura e alla cultura svedese ed anche alle mie esperienze di vita in altri luoghi, per esempio l'Italia. Il mio obiettivo in arte è quello di creare la mia realtà ,basandola sulla fantasia. Il mio mondo fatto di fantasia viene da i miei veri ricordi ed esperienze. Tutto può diventare una realtà, anche l'irreale,bastano i sogni ed i movimenti di un pennello. I miei ricordi luminosi di quando ero bambina e il mio amore verso la vita sono la base della mia arte. Amo combinare e utilizzare le tecnologie nuove e tradizionali. Credo che l'arte nel futuro per sopravvivere deve evolversi oltre i confini conosciuti. Il mio intento è fare in modo che la mia arte vi trasmetta le emozioni che dato a me quando realizzavo le opere. La mia arte è piena di fantasia e amore per la vita. La più bella e luminosa stella nella sfera celeste, è un diamante e può essere vista solo da chi ha gli occhi illuminata dalla luce della luna. “Diamond art “ può quindi essere sperimentata solo da chi possiede una elevata concentrazione di fantasia e una profonda gratitudine verso la vita. Come la chiamo io è la fase di “Imersi nella Luna-“. Mi auguro che gli spettatori della mia arte potranno sperimentare cosa vuol dire "Danza Arcobaleno " tra le nuvole e la "passeggiata al sole" tra i sentieri i meravigliosi della realtà e della fantasia. Voglio presentare un amore infinito verso la vita.